Is it possible to charge a Raider? Well I dunno. We weren't even halfway through complaining about the new codex, and now we have to complain about these changes to it. How many hours of the day does GW think we can devote to complaining? We need our sleep! Distances are measured from the bases of models (unless they are Hovering), and our Raiders and Venoms float over 1 inch above the ground, so... doesn't that mean that our vehicles can't be charged? How are charge distances measured to a raider? Even if the 1" is possible in the fight phase, does the unit need to stay directly under the raider, basically needing one more inch on the charge throw? I always measure movement to/from the hull. It just seems logical. well there is nothing wrong with theorising? Oh. I have nothing against a talk about theorical abuse. I find it amusing. But doesnt this mean you cant charge with a raider? Or will you argue that you can tip the raider and then the hull is 1" away from the unit you charge? If I want to charge 5 space meringues standing on a crate 2" above the ground, my charge automatically fails because there is no room to place the charging unit within 1" of them. That is perfectly fair. If those 5 space meringues want to charge my raider, which is 2" above the ground, and there is no room to place them within 1" of its hull, the charge should be allowed anyway. Otherwise it's against sportsmanship. I'm afraid I don't see it. Fairness should work both ways! If I can't charge them 2" above the ground why can they charge me 2" above the ground? But doesnt this mean you cant charge with a raider? It does, yeah. Unless you're charging (or being charged by) something that also measures from the hull. It also means that even flying models can't charge you if they measure their distances from their base, such as Demond Princes and Hive Tyrants. Look, I know it's weird, but that's what it says: if you can't place the charging model within 1" of the model(s) being charged, the charge fails. If we're going to ignore that FAQ and allow our raiders to be charged anyway, I want to be able to charge an imperial guardsman standing on a footstool. Fair is fair! I understand your pont. But you don't correct 1 mistake by doing another mistake. Sorry, it's GW we're talking about. I totally agree with you. But what if i tip the Raider a bit so when i charge, the hull is within 1" of the base of the model i charge? Doesnt this give DE a huge advantage as long as we dont magnetize our ships? I mean RAW is RAW, not talking "fair" here. ACTUALLY... the raider is on a ball and pivot, so if you know you are charging with it that turn, push the nose of the vehicle downwards until it is just above the tabletop. That way, you can charge. If you fall back next round, pivot it back up to prevent the opponent from charging. Now, having said that, I think anyone that even mentions this tactic during a game should get punched in the throat. ATTITUDE: It is the difference between an ORDEAL and an ADVENTURE! See this guy gets it!... Now should the raider survive, you can just pivot it up again and the unit now have to walk all the way around it, as they cant charge it or move through it... Oh this is brilliant! It's not as if anyone fears a charging raider. You do it to take the Overwatch, or to prevent a tank from shooting, and tanks measure distances from their hulls too. So couldn't you charge in, and then retilt your raider during the 1inch consolidation so that it cant attack or be attacked? Seems like a great way to get upto an 12 inchs extra move each turn of possible? "Hovering: Instead of measuring distance and ranges to and from the models base, measure to and from this models hull or base (whichever is closer)". I get the reactions here, but this question really hasn't been sensibly answered at this point. Is it a clearly abusible situation for a T'au Commander standing on a barrel to not be able to be charged? I think the answer to that is a clear yes. In the previous FAQ they explained this situation essentially saying use the wobbly model syndrome and imagine your model is within 1" even though you can't place it there. 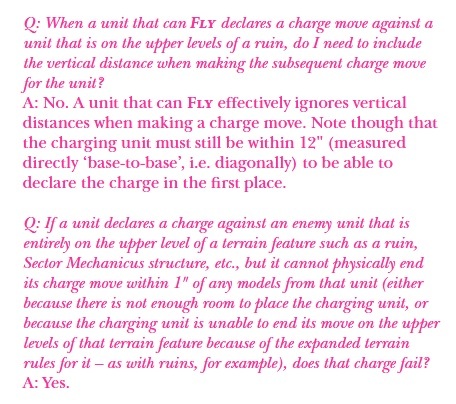 In this FAQ they have changed that to say if you can't place the model within 1" then the charge fails. That means they have considered the game consequence against the visual representation, and decided it is better to have the T'au Commander on a barrel immune to assault. As bizarre as it seems GW has deliberately allowed a split level defence from assault which does break the game in some ways. When it comes to the Raider and Ravager, it is possible to get infantry models within an inch of the base, so it is possible to charge, but unless we ignore that FAQ ruling, you could have a situation where someone is say 8" from the front of the shock prow, but needs a 12" charge roll to get within 1" of the base. To avoid this silliness we need to say we play a house rule (and expect everyone else to play it too) where we count a model's body as part of its base in cases where there is a minor level split. However, that isn't in the rules, although perhaps it should be. Some of the responses to this thread have been a bit over the top considering GW has specifically allowed level abuse in the case of ruins. I would say RAW, only other vehicles would be able to charge the hull of the Raider. Infantry, or things with bases in general have to get within 1" of the base. Also in the RAW spirit, there is no rule allowing you to adjust your model's stance during the game, so you should be prohibited from tilting the nose up or down for game advantage. Thanks, I guess that's the only correct answer! But this means that charge distances to and from raiders always need to be measured from the base because it is not possible from the hull. EDIT: This gives the raider and embarked troops additional shooting range over charging enemies, because the hull extends farther then the base. you want. If you delicately balance it in place, it is very likely to fall as soon as somebody nudges the table, leaving your painted model damaged or even broken. In cases like this,we find it is perfectly acceptable to leave the model in a safer position, as long as both players have agreed and know its ‘actual’ location. If, later on, your enemy is considering shooting the model, you will have to hold it back in the proper place so they can check if it is visible. cannot be moved through other models or through terrain features such as walls, but can be moved vertically in order to climb or traverse any scenery. This together means that any model can be moved in ANY direction and you can pretend it to be where you put it, even 5'' in the air. I bet there is always a possibility to charge anything under this rule. The idea of having infantry models floating in the air without having any contact to the board sounds badly broken to me. I always interpreted the WOBBLY MODEL SYNDROME (pg. 177) such, that a model needs to be able to stand there, but if it would fall or move because of the slightest vibration you can place it somewhere else to prevent (real physical) damage to the model. And it sounds badly broken to me trying to find a loophole so the enemy cannot charge a raider. Raiders can be charged because you measure the distance from the base and hull. So there is no loophole there. I just wanted to get it right with the rules. But placing infantry floating in mid-air sounds strange to me. And I have doubts that anybody will agree with me if I tell them that I can place my e.g. wyches in mid-air. I meant it simply as a defence when someone tries to pull that "you cant charge my marines on the crate" on you. :-) But technically it is correct and it gives you very little advantage if you did that, coz the opponent can do the same. BTW thats why planes have specificly stated rule that they cannot be assaulted by ground forces. Exactly because of these rules would allow it. Its all pretty balanced IMO. Subject: Re: Is it possible to charge a Raider?